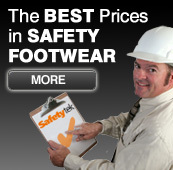 Ukprepare GB Ltd has many years experience in the purchase and sale of safety products. Visitors are welcome to our premises, where our stock and distribution services can be demonstrated. We currently have over 53 000 products in stock and have been selling protection products since 2001. Safetytek stocks all the leading brands in our West Midlands warehouse. Telephone or fax orders using our full product catalogue are dealt with quickly and efficiently and can on request be delivered locally on the day ordered. Our client list includes many companies from large corporate companies though to sole traders. We only use the strongest encryption available on the internet today. We don't store any of your credit card details. We accept all major cards. Need any more reasons to buy from Safetytek? Can’t find what you’re looking for anywhere else? If you can’t find it in our catalogue or on the web it doesn’t mean that we can’t get it for you. Call our sales team and let them take the stress for you! Try us now on 0844 8848752 or send us an email and let us find it for you. Changed your mind? No problem! Safetytek offers you a 100% ‘No Quibble’ satisfaction guarantee that allows you to return an un-opened item within 30 days and you choose whether we replace, refund or credit your account. Talk To A UK Based Call Centre! We only use UK based call centres. In fact we are here to take your calls. Need to order one 1 pair of gloves? – No problem. You can order any amount of any product you want and we’ll ship it to you.